And boy, thank goodness for that! 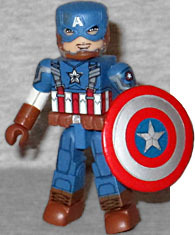 Cap's Avengers costume was not as good as his WWII look, so going back was smart. This is not just a re-release of the Series 40 figure, however: more of the details are painted, rather than sculpted; this barely even looks like the same version of the guy! The helmet is thinner and fits better, and though his gloves are merely painted on, he comes with the alternate hand that his shield can plug onto. Captain America's friends are being targeted by a highly trained assassin known as the Winter Soldier. Masked and with a cybernetic arm, his identity is a mystery. 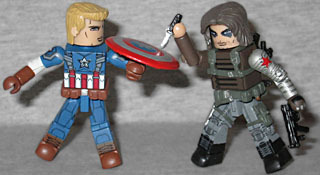 Like Cap, most of the Winter Soldier's details are painted on. 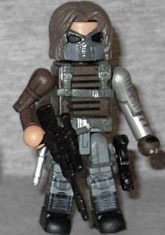 He has a harness, and a belt, and straps around his thighs where his guns can plug on, but his boot, kneepads, and jacket are all simply painted on. It might have been nice if his robot arm was a sculpted element, but the paint does match the movie style perfectly. His mask is molded as part of his hair, and the set includes brown Sin-Eater hair if you want to see his silly raccoon eyes. Befitting a soldier, he's armed with two knives, two silver pistols, two MP5s, and a sniper rifle. This is even better than the "real" figure got!